Originally published April 13, 2014 in the Boston Business Journal. 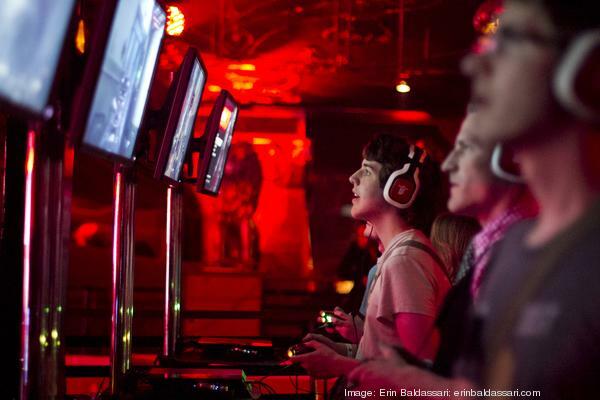 North Carolina native Stephan Coehr drove 14 hours to attend PAX East and stumbled into the Bethesda Softworks’ celebration of its newest game, “Wolfenstein: The New Order,” at the Royale in Boston on Saturday, April 12, 2014. Coehr said he wouldn’t have tried the game otherwise, but now plans to recommend it to friends. Photo by Erin Baldassari/Boston Business Journal. At the entryway to the Royale nightclub in Boston on Saturday, a familiar folk ballad seeped down the stairs, except something was different about this version of “The House of the Rising Sun” that the Animals made popular in 1964: the lyrics were all in German. Inside, a floppy-haired host addressed the crowd in a thick German accent. It was all part of the fun for Bethesda Softworks’ celebration of its newest game, “Wolfenstein: The New Order.” Set in an alternate universe where the Nazis won WWII and somehow gained advanced technology, the game’s protagonist, BJ Blazkowicz, must battle robotic guard dogs and cybernetically enhanced super-soldiers to overthrow the evil regime. The mock “Neumond Records” release party featured a live band singing German covers of popular 1960s rock tunes, German-style food and lots of free swag, included a branded messenger bag and free 45 vinyl album. The game won’t officially be released until May 20, but gamers at the Royale were eager to get their hands on it. Joseph Simpson said he tried a demo at last year’s PAX East convention and approved of the updates that had been made since. “It’s much more balanced now,” Simpson said, adding he had died in the same spot five times when he first played the game. First-time PAX Easter Dorothy Sisk said she hadn’t played earlier games in the Wolfenstein series, which began two decades ago with Wolfenstein 3D, but she’s hooked now. The game features Quentin Tarantino-style gore with heads obliterated by shotgun shells and blood-soaked hands clutching grenades.